Up In A Bow opened last year due to the owner's love for crafting and upcycling. 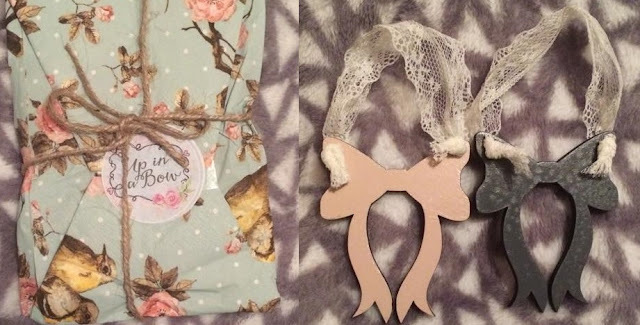 The shop specialises in small unique pieces such as photo frames and hanging decorations. It has such a vintage feel to it, with lots of florals and lace on there. I was intrigued by the hanging bows on offer. There's lots of hanging hearts about but bows seem like a such a cute idea so I had to have me a couple! 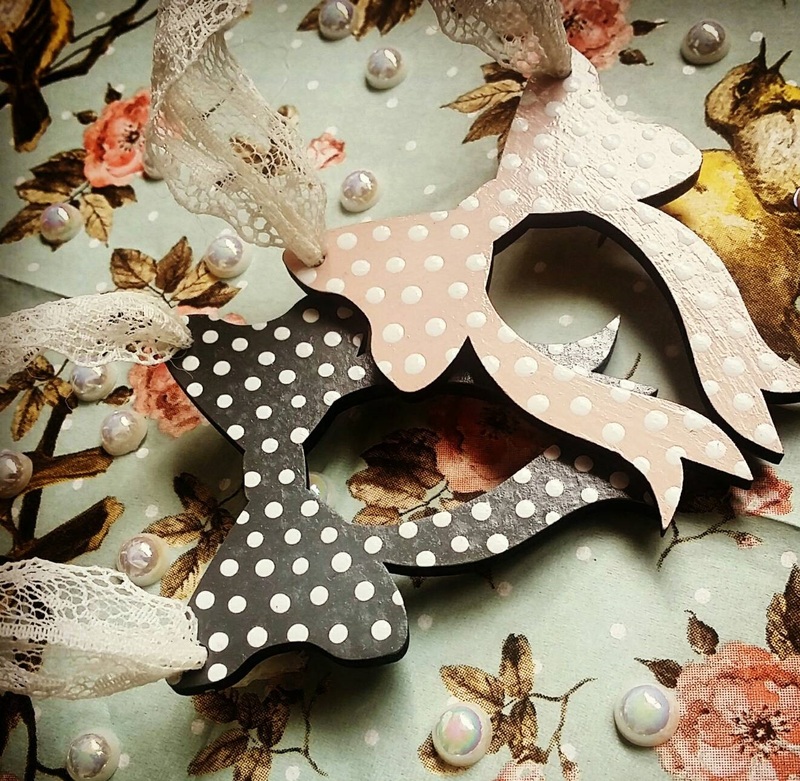 My colour scheme is grey and pink so I went for a grey polka dot bow and a pastel pink polka dot bow. I had mine made on lace ribbon but you can have ric rac, satin, gingham etc. So they're very customisable. Lace gives the bows such a vintage feel which I absolutely love. The bows came packaged beautifully in this gorgeous wrapping, tied with natural twine. The back of the bows are painted in the matching colour of your choice but without the dots, and the sides are left exposed and then varnished. I think it looks cool like that as the grain of the wood is visible. There was lots of cute confetti packaged up with my bows. Some heart shaped music sheet confetti and some gorgeous little pearls. This was such a nice surprise - I love when sellers put effort into their packaging. It really does make a difference. The bows are very precisely painted as you can see, I guess a dotting tool is used as the polka dots are flawlessly done. There's no brush strokes to be seen at all on the piece actually. At just £5.25 for two, these are a steal and they're absolutely gorgeous. 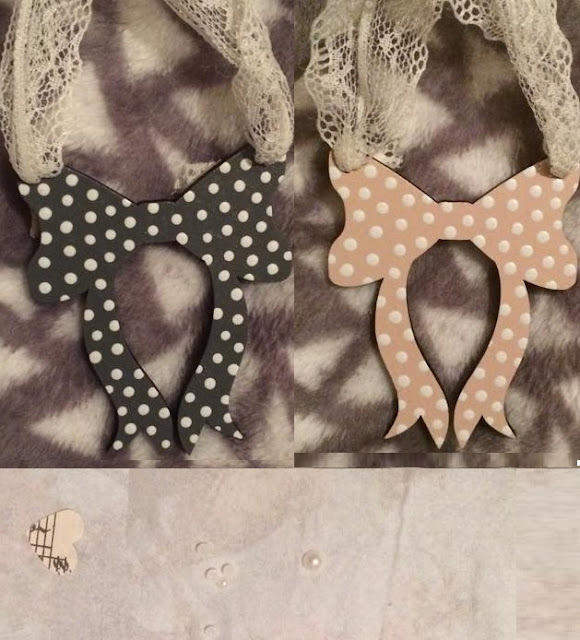 Hanging bows are such a unique idea and I can't wait to display them in my home. Check out Up In A Bow on Etsy and Facebook.